One of the best ways to ensure your cat lives a long and healthy life is to make sure they are vaccinated against common cat illnesses. Your cat’s mother gave her kittens immunity from diseases through their milk, but now your cat is on their own. With your help – and help from Dewinton Vet – your cat can be protected from feline illnesses. Vaccines have small amounts of dead or altered viruses, bacteria or organisms. When you vaccinate your cat, their body learns how to adapt to these diseases, and stores this into the immune system. When the virus is encountered again, it’s easily taken care of. Generally, the best time to get a cat immunized is after 9 weeks old. This is the time to begin vital vaccinations, with booster follow-ups every 3-4 weeks. Thereafter, your cat will require vaccinations for the rest of their lives. Consult with your vet about regular vaccination schedules. Which Vaccinations Should My Cat Get? 1. 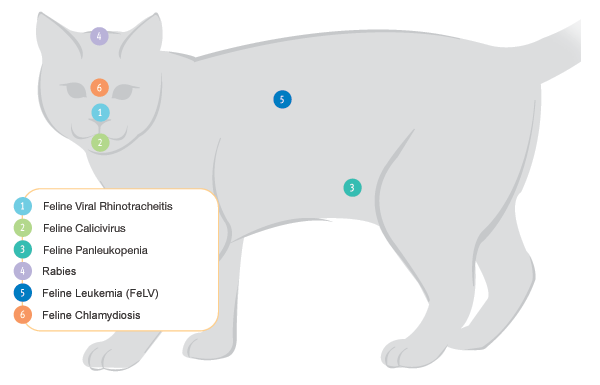 Feline Viral Rhinotracheitis is like the common cold for cats. This upper respiratory tract infection is easy spread from cat-to-cat, so vaccination is imperative. Its symptoms include moderate fever, loss of appetite, sneezing, eye and nasal discharge and coughing. Kittens are particularly affected, but this disease can be dangerous in any unprotected cat. Even if the cat fully recovers, it will carry the disease for the rest of their life. 2. Feline Calicivirus is another major cause of upper respiratory tract infections. Widespread and highly contagious, its symptoms include fever ulcers, blisters on the tongue and pneumonia. These can range from mild to severe. Once again, treatment can be difficult, even if there is a full recovery, the disease will lie dormant for life, and can infect other animals. Vaccination is extremely important. 3. Feline Panleukopenia, otherwise known as feline distemper, is a disease that is caused by a virus so resistant, it can survive up to one year outside a cat’s body. Therefore, mst cats will be exposed to it during their lifetime. Infection rates in unprotected cats can run as high as 90 to 100%. Vaccination against this potentially fatal disease is essential. Symptoms can include listlessness, diarrhea, vomiting, severe dehydration and fever. Luckily, the vaccine itself is very effective in preventing the harmful illness, as treatment is very difficult and even if recovery take place, a once infected cat can easily spread the illness to others. 4. Rabies is an incurable, viral disease that attacked the nervous system of most animals, including humans. It is spread through contact with the salvia of infected animals, through bites or any break in the skin. Vaccination will provide your cat with much greater resistance to rabies is he is exposed to the illness, but there is no cure. For this reason, many cities require that cats and dogs receive their rabies shot on a regular basis. Plus, to travel with your cat, you must be able to prove they have received a rabies vaccination. 5. Feline Leukemia (FeLV) can result in a multitude of serious health issues for your cat, everything from cancerous conditions such as leukemia to a wide range of secondary infections, a result of the destruction of the immune system. In fact, it is the leading cause of death in North American cats. After initial exposure to the virus, a cat may show no symptoms of its existence for months, if not years, all while infecting others. Testing is available to determine if the FeLV virus is in your cat, but whether they have been infected or not, they are likely to come into contact with a cat that is. 6. Feline Chlamydiosis is a bacterial disease that is responsible for 15% to 20% of all feline respiratory diseases. It is extremely contagious, especially in kittens and the infection rat is very high. It causes a local infection of the mucous membranes of the eyes and also the lungs. It can be transmitted to humans as well through direct contact. Vaccination is the preferred method for prevention. Feline Infectious Peritonitis which can strike many different organs, such as intestines, liver, kidneys, and lungs. It is most often seen in mid-aged cats. Like any drug treatment or surgical procedure, vaccinations cannot be 100% guaranteed. They are, with proper diet and living spaces, the best defense against disease. Plus, when you consider treating a serious illness, and the costs associated, prevention through vaccinations is the best option.